Honey, our protagonist, is on the run from both her past and her present; avoiding questions about love, bodies, language, and the extents of all three. But her friends—the impish Maenads—refuse to just let her escape. 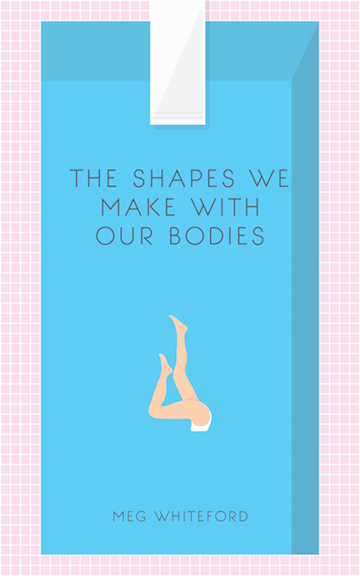 The Shapes We Make With Our Bodies is a feminist, queer, maximalist piece—spanning caves, hills, courtrooms, and kitchens—about a woman torn by her desires, unwilling to bend to the needs of men, yet hesitant in the face of her wildness. "Meg Whiteford, a bold new voice, moves us forward by returning us to a theatre that isn't afraid of dramatic poetry, shapeshifting characters, plots motored by comic metamorphoses, and endings vibrating with tragic loss. She is a 21st century risk-taker, inspired by the daredevil predecessors that startled previous centuries into recognizing the stage as a fluid dream." "The Shapes We Make With Our Bodies is a guide for a brutally funny flesh-and-blood cartoon that is, in part, about recovery. Yoga, therapy, shrooms, witchcraft, Tarot, sacrifice: Meg Whiteford slants each into off-kilter rituals that, like her rich and wily stage directions, member and dis-member the play's world, along with our heroine Honey's sense of self. In this way, the play itself plays Maenad, even as there are Maenads in its pages—tearing through a lurid country of horror film references, broken memories, puns, remixed Herculean labor, and spas—lyric, wild, and murderous." "Meg Whiteford is a master of poetic diction, with turns of phrase and leaps of language that are spellbinding. This text carries echoes of Anne Carson, Kathy Acker, and even Allan Kaprow, yet despite these powerful influences it speaks in an original voice (voices, more properly) and represents the impasse of gender and desire. It's lodged in the mode of tragedy, with hubris, flaws, and unknowingness, but the outcome is a text of the 21st century. She's got a keen eye for a theatre of her own making—polyphonic, choral—and for balancing the tragic with a knowing comic quality. I expect great things from this." "In The Shapes We Make With Our Bodies, Meg Whiteford pulls us deep into wild environments birthed from her own urgent imagination, hovering between the lines of poetry and theatre before rocketing off into the stratosphere. From sensory and earthy to heady and intellectual and back again, the play takes over our brains in kaleidoscopic fashion before depositing us, gently enough, in a nowhere-place that looks suspiciously like the Catskills."